H.E. Dr. 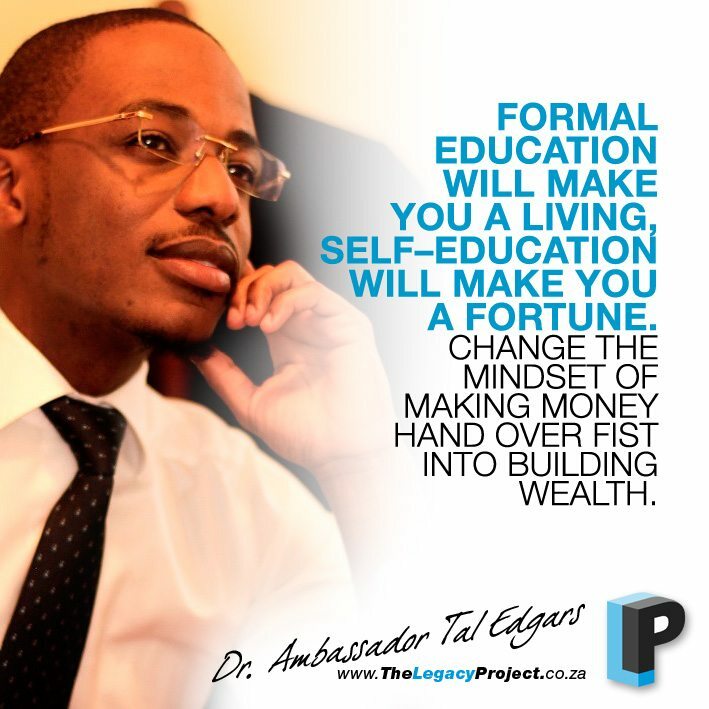 Ambassador Tal Edgars is one of the most sought after business strategists of our time. He is the founder of the GBSH Consult Group and companies such as GGKAfrica, Edgars International, Tal Edgars Media Franchise. He is also the author of “Good karma in Business”. He sits on the board of several companies and NGO’s too many to mention. GBSH Consult is a top global management and strategy consulting firm that delivers essential advantage to the world’s top influential businesses, individuals and organizations both on the government and commercial side. My Definition Of Success | Personally, Success is doing that which resonates with your heart that provides some quality of service to others. Yes my definition has changed. Cosby said “In order to succeed, your desire for success should be greater than your fear of failure. Over the years, I have been able to continue to tune the critic both inside and outside and spending time with OQP (Only Quality People) has impacted differently on my outlook. They say as the twig is bent so does the tree grow. The mind comes, finally to take on the nature of the influences which dominate it. Success is a mind affair within our circles. People, who think like you, see it for you whereas people who can’t see it for themselves, can’t see it for you. I call it the Homecourt Advantage. I Am Driven By | I am driven by an achievement mindset. Many people die at the age of 21 and get buried at the age of 65. I call them the walking dead. Les Brown Said “In every day, there are 1,440 minutes. That means we have 1,440 daily opportunities to make a positive impact”. I reflect most times on what happens when we look at how the past leaders have fought for independence and I question where do we fall in. What legacy do we want to leave? Observe with profit when Napoleon said, Men will be paid, not merely for what they know, but more particularly for what they do with that which they know. It would be a shame to die, without having made a major contribution to human kind. 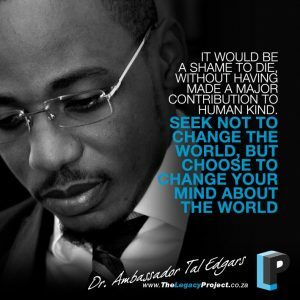 Seek not to change the world, but choose to change your mind about the world. My Highlights | I have had the privilege of working with some of the most brilliant minds of our time and the idea of collective consciousness or some sort of universal library adds further weight to the holographic model that we are all connected. Together we have worked on changing the mindset behind leadership efficacy, mentorships, scenario planning, strategic foresight linked to developmental environments, Entrepreneurship, enhancing public service and the global dialogue on change and Africa Rising. Being behind global companies like GBSH Consult Group, which have led a programme of interventions to drive Africa’s transformation towards a knowledge based economy. Our innovative agenda on education and skills providing the latest thinking on the critical importance of education and highlighting what can be done in each African country and will provide access to education, strengthen educational quality, improve workers’ skills and increase equity – across income level, gender and other demographic subgroups. Learn to hear your fixed mind-set “voice” – As you approach a challenge, that voice might say to you “Are you sure you can do it? Maybe you don’t have the specific talent.” The words of John Henderson echoing constantly when he said, “The toughest opponent of all, is the one inside your head. Always recognize that you have a choice – How you choose to interpret challenges, setbacks, and criticism is your individual choice. You can interpret them in a fixed mindset as signs that your fixed talents/abilities are lacking. Or you can interpret them in a growth mindset as signs that you need to ramp up your strategies and effort, stretch yourself beyond your comfort zone, and expand your abilities. Take the growth mindset action – Over time, which voice you heed becomes pretty much your own choice. Whether you take on the challenge wholeheartedly, learn from your setbacks and try again hearing the criticism and acting on it. It is now in your hands. Practice hearing and discerning both voices, and practice acting more on the growth mindset. See how you can turn this in your favour. This has not only built me a wealth of rolodex of connections but also a valuable return in all businesses that I am involved in. PERSISTENCE AND DETERMINATION – Calvin Coolidge said, “Nothing in the world can take the place of persistence. Talent will not; nothing is more common than unsuccessful men with talent. Genius will not; unrewarded genius is almost a proverb. Education will not; the world is full of educated derelicts. Persistence and determination alone are omnipotent. POSITIVE SPIRIT AND MIND -Nothing of worth or weight can be achieved with half a min, with a faint heart, and with a lame endeavor. Earth beneath me, Sky Above me, Fire within me. POWER TO VISUALIZE AND BUILD -Visualize this thing that you want, see it, feel it, and believe in it. Make your mental blueprint and begin to build. Vision is a love affair with an idea. Lastly plan purposefully, prepare prayerfully, proceed positively and pursue persistently. These attributes have not only shaped me as a leader but also as an Entrepreneur who has been behind building many companies. George Bernard Shaw said “The people that make it in this world. Look around for the circumstances that they want, and if they do not find them, they create them”. If you do not program yourself, life will program you. How I Use My Mind | I am of the considered view that we are what we think. All that we are arises with our thoughts. With our thoughts we make our world. Quantum physics suggests that our intangible impulses of thought are somehow transmitting into their physical counterpart. That is why I have a group called the OQP – Only Quality People. A Master Mind Group that shares and reflects on the greatness within, power to not go through situations but grow through them, power to choose success and purpose. It is this same reason why I tell many people when I speak at public seminars and conferences, that if they realized how powerful their thoughts are, they would never have a negative thought again. My brain became magnetized with the dominating thoughts of purpose, stepping into greatness, not having courage absent of fear but courage that moves past the fear, making a decision to act now. Fast forward to today and soap box aside, I became successful with everyone around me in whatever we do. New ideas do not grow in closed minds. Resources I Use To Stay Inspired | In this generation of diversity I tend to gravitate more towards people, books, environments, movies, music and many other ways. Case in point, after having read the book “Future Shock” by Alvin Toffler and seeing what was predicted in 1970 or Prof. Walter Baets on “Rethinking Growth” come from hypothesis to actual today-situations that take shape, is fascinating. Just going over each of the lessons and audio books of the likes of Zig Ziglar when he said, “You can have everything in life that you want if you just give enough other people what they want”, Dr. Norman Vincent Peale when he said “ Change your thinking, change your life”, Jim Rohn when he said, “When the end comes for you, let if find you conquering a new mountain, not sliding down an old one” and Earl Nightingale, “ All of us are self-made but only the successful will admit it”. All these are ways to self-educate and change my mental blue print on many areas of life. We must look upon ourselves as a company with our own intellectual balance sheet and brand name. We need to invest in ourselves. The Best Advice I’ve Received | I had a great mentor in a fellow academician who upon receiving his Professorship told me, “Those with experience and understanding in a certain area are able to assess situations and mentally simulate their outcome faster than a novice could get a notebook out”. This pushed me to always live by the code of be prepared for any opportunity even when there is none than to have an opportunity and not be prepared. I became hungry to succeed. 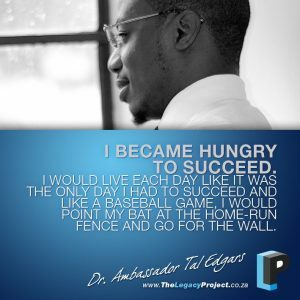 I would live each day like it was the ONLY day I had to succeed and like a baseball game, I would point my bat at the home-run fence and go for the wall. a) Fix in your mind the exact amount of money you desire. It is not sufficient merely to say “I want to have a lot of money”. b) Determine exactly what you intend to give in return for the money you desire. c) Establish a definite date when you intend to possess the money you desire. e) Write out a clear and concise statement of the amount of money you intend to acquire, name the time limit, state what you intend to give in return for the money, and describe clearly the plan through which you intend to accumulate it. f) Read your statement aloud twice daily. Keep in mind that a dream written down with a date is a GOAL, a goal broken down into steps becomes a PLAN, a plan backed by ACTION makes your dreams come true. There is a reason in making a commitment and documenting it to help in its attainment. The first is LOGICAL – you have to know where you are aiming for. The second is BIOLOGICAL- Our Reticular Activating System (RAS) decides what we pay attention to and focus on. We have 60, 000 separate thoughts daily and the RAS only keeps what it believes to be important. The Legacy I Would Like To Leave | There is a bright future ahead of us. Theodore echoes this when he says, “You may not be able to leave your children a great inheritance, but day by day, you may be weaving coats for them, which they will wear for all eternity”. I want to be remembered as the man who did not stand by to effect change but as great people would do, push and make others realize the insignificance of circumstance to be successful. Also, that I lived so evidently by the saying. “Carve your name on hearts, not tombstones. A legacy is etched into the minds of others and not the stories they share about you”.